The finale of the Wet Summer 2016 took the form of yet another big rain event--one day before Autumn began. A slow-moving weather system set the stage for more pounding rains, and as the sun set on September 20, strong thunderstorms developed along a warm front draped between Nebraska and far southern Minnesota. The storms drenched Waseca and Steele Counties, along with the southern Twin Cities metro area. But the 1-4 inches of rain associated with this initial round of round of activity would not be the main event--that would come later in the day on the 21st. On the evening of September 21st, the front had become more or less stationary across southern Minnesota, and helped focus multiple round of intense storms, which formed and reformed throughout the evening. Several hours of repeat thunderstorms led to excessive rainfall totals in two main areas: in a narrow band across the northern Twin Cities, and also over south central and southeast Minnesota. 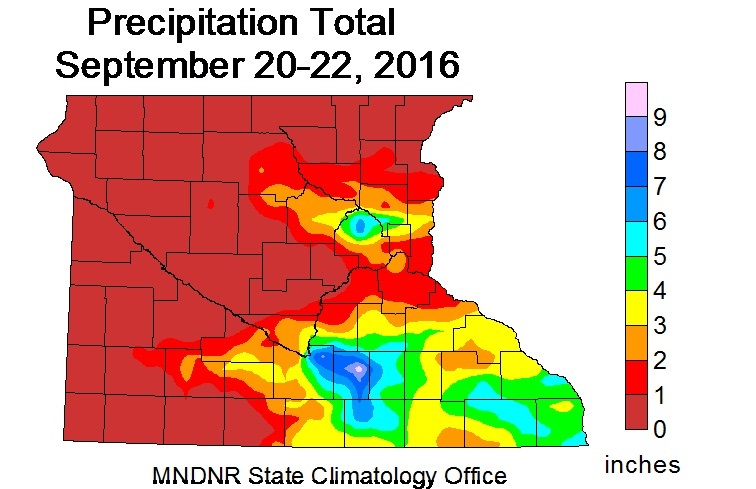 Heavy rains, though not as extreme, fell throughout the remainder of southeastern and east-central Minnesota. In the northern Twin Cities, the highest 24-hour rainfall total found with a manual rain gauge was 8.11 inches, recorded by a CoCoRaHS observer in Maple Grove. Other totals of 5 to nearly 8 inches were common from Corcoran in Hennepin County, through northern Fridley in Anoka County, and into the northern portions of Ramsey County. Flooding was common, with residential damages in Maple Grove, and over 60 abandoned cars during the height of the storm. Another area of heavy rains fell in an area from Mankato eastward to into western Wisconsin, with a pocket of especially high values just southeast of Mankato. In Wascea, the indoor ice arena had six inches of water on the freshly-iced rink, Loon Lake rose over its banks and inundated nearby streets in town, and numerous homes and businesses had severe flood damage. Waseca also recorded its all-time largest 24 and 48-hour rainfall totals, with 7.64 and 10.16 inches, respectively, at the U of M Southern Research and Outreach Center. The event was a major contributor to Waseca setting a new annual precipitation record for the state. The National Weather Service in Chanhassen compiled a summary of the September 20-22 heavy rain event.